The optimist in me truly believes that with every dark cloud there is a silver lining. Today the silver lining was something so simple as tea. Still in the midst of my flu bug, I have been big on Bigelow, and intertwined with Twinings (giving myself a pass on my loathing of most puns) for the past two days. A little lemon, some honey, even a squeeze of fresh orange added and I am good to go; you would think, anyway. So far the hot tea, meds and extended rest aren’t quite shaking this bug, and now on top of that I have to go through the day hoping my bosses can get coverage for me at work tomorrow. But back to the silver lining. Two Christmases ago, for our holiday open house, a friend brought me a hostess gift in the form of a whimsical, cone-shaped little cardboard box of teas, labeled Teaforté, a brand I wasn’t familiar with. I thought it was a gracious gift, and after the party I put it in the pantry with the rest of my assortment of teas. I drink iced tea year-round, but unless I am sick, I drink hot tea maybe once a month. I am more prone to coffee, starting with the espresso or pressed I make at home first thing in the morning, to another 2-3 cups of the brewed stuff at work. But I do enjoy having a nice variety of teas for tea-drinking guests. The packaging on this product would have definitely warranted an A+, along with possible awards back in my Graphic Design days at San Diego State; but here it was, mine for the opening and drinking, and what an uplifting, pleasant surprise to find such a unique way of presenting something so simple as tea. 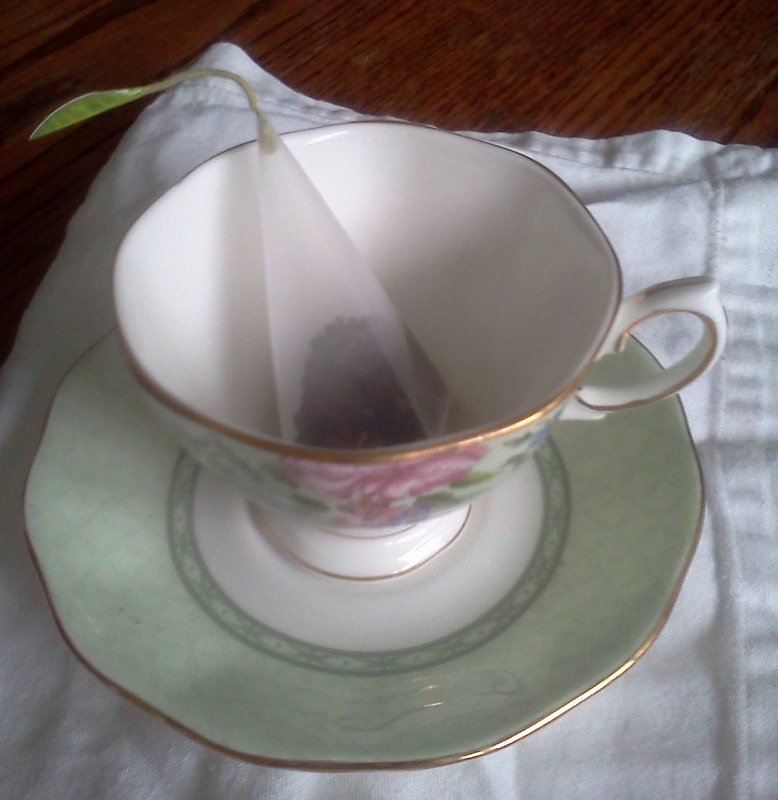 Each “infuser” was cone-shaped netting containing crushed tea leaves, with an attached string topped with a small leaf (see photo). Two boxes of each flavor, I sipped the Harvest Apple while taking a soothing bubble bath, then chose the Sweet Ginger Plum flavor — drinking that as I write this. Hazelnut Truffle is up next, and maybe I’ll go around again as the day progresses, finishing up the whole box. Will drinking the special tea nurse me back to health? Chances are no, but my spirits are nourished, just knowing that you don’t have to wait for the perfect time, place and people to get out the good stuff. You’re special enough. Do it today. There is nothing like a sick day to make one reflect on the priorities of our lives. Think I will go burn that “pyramid” shaped candle and have a cup of tea. Thanks for reminding me of Erma Bombeck’s wisdom. Getting caught up in the craziness of work, we forget about the little pleasures of life that are so priceless.